Adams has prescribed the Zones. 11 of them. This had consequences. In the digital case, it seems, severe ones. To access all 11 zones on a sensor, the middle tone needs to be placed very low, 5 steps lower than sensor saturation. The reduced number of tones (or, in other words, limited number of levels per stop or zone) turns into the loss of detail resolution. Pulling details and color from those underexposed middle tones and shadows is very painful. Noise starts to raise its head, color smudges and blotches appear, the details become rough, and the image loses plasticity. If one is shooting in raw, they may be interested to see if there is any benefit in using intermediate ISO settings, such ISO 125, 160, etc. There is, however, no single answer to this question. Why? Because everything depends on how you implement these intermediate ISO settings in the particular camera. 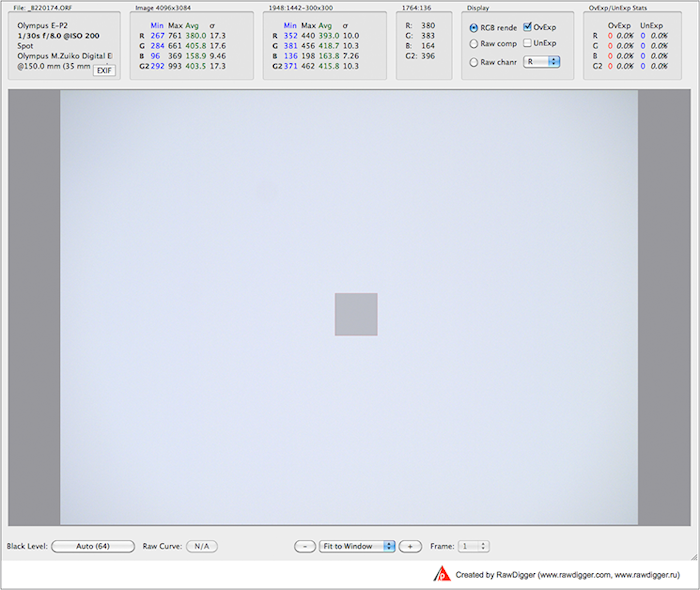 Sometimes they are implemented the same way as the main ISO settings, but sometimes they are the result of certain manipulations, such as digital multiplication. We are going to take series of shots varying ISO settings from the lowest to the highest using, of course, every intermediate ISO setting available. The subject of the shots doesn’t matter – hell; you can even shoot with the lens cap on. To allow users to activate RawDigger in both trial and fully licensed modes without direct Internet access, manual activation mode is added. Camera support: Nikon Df color data were copied to D4 (the Df device data is better, and the CFAs are practically identical). Bug fix: There used to be a possibility of the program crashing while opening new files in a very rapid succession because the new file was opened before exiftool was finished processing the previous one. Part of the problem is in how one sets the exposure. To set the exposure correctly it is good to know how the in-camera light meter works, and how it is calibrated. So, what is exposure meter calibration and why is it important? Understanding of the exposure meter calibration determines the outcome of the exposure. What does this mean? Well, let’s take a closer look. RawDigger is Shareware now. You can use it free of charge during 30 days trial period. To continue using RawDigger after the end of the trial period please purchase the License. 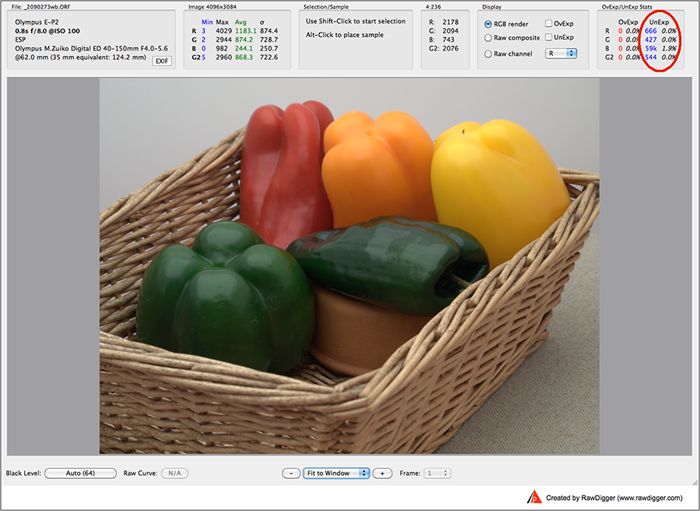 Exposure Edition for everyday use: it displays RAW data in all modes (RGB, RAW Composite, and RAW per channel), indicates over- and underexposed areas, displays of RAW histogram, image statistics, statistics and histogram for selected area. Research Edition is intended for camera/sensor evaluation (personal use and for preparing reviews, as well as to help with programming RAW data processing); it includes all the functionality of the Exposure Edition and adds TIFF export, multiple selected areas via Samples, tables of sampled data; statistics and histograms over multiple samples, exporting sampled data as CSV and CGATS. Profile Edition helps to create sensor calibration data, linearization data, or device data for color profiling. It adds selection grids for faster processing of step wedges and color targets, as well as for calculating non-uniformity maps. Profile Edition allows to apply white balance, normalization, equalization (Flat Field), and filtering of outlying values before data export. See Compare Editions table for details. Read more about RawDigger 1.0.0 Released! For Sigma SD1 and Merrill cameras all raw sizes are supported, High, Medium, and Low. RGB rendering is supported for all cameras, but with different quality; for SD1 and Merrills it is more usable, for DPxx pre-Merrill series it is just usable, for SD9-SD14 and Polaroid x530 it is very rough. For SD9-SD14 and Polaroid x530 cameras only Auto White Balance is available. 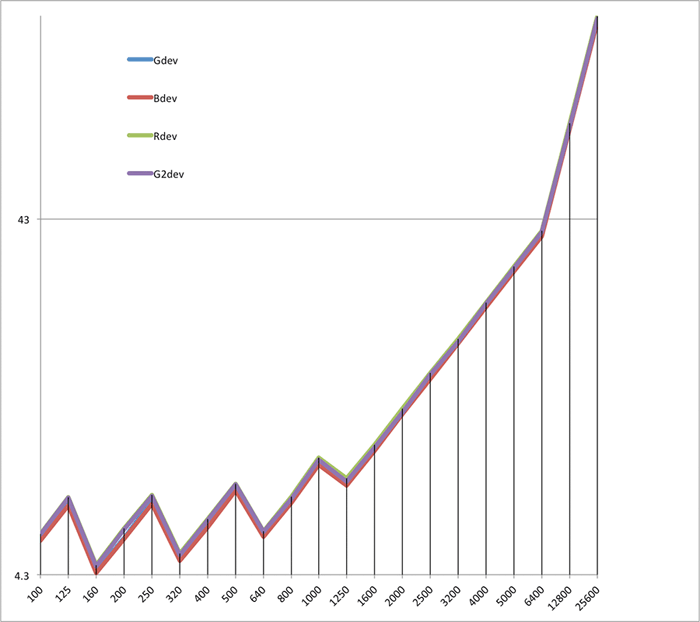 Precision of the of floating point values is increased in exported files. Exporting Bayer RAW data as single channel (grayscale) TIFFs. This feature is most useful for exporting data obtained from DIY black and white cameras with removed CFAs (maxmax.com and similar methods). The last set of Selection Grid parameters are now automatically saved and reused when the program is restarted. Remember the list of used folders ("traditional" behavior) to display the list of previously used folders. Standard list: include only Desktop, Documents, Pictures, TEMP, and Home folder. For CGATS file export, the fields that can potentially contain a space are now enclosed in single quotes. RAW/RGB data can be exported as an Uncompressed TIFF. For compressed TIFFS, the compression factor is increased (files are smaller). Floating point numbers now contain no less than 4 significant digits (with the exception of percentages of over and underexposed pixels, where only 3 significant digits are used). Enabling this setting prevents RawDigger from checking updates when starting the program. Consequently, the scripts noCheckUpdates.reg for Windows platform and noCheckUpdates.sh for OS X platform are not provided anymore. LibRaw has been updated, adding support for the following cameras: Panasonic LF1, Panasonic GX7, Fujifilm X-M1, Canon EOS 70D, Sony RX100II, Sony RX1R, Olympus E-P5.